Missouri is currently experiencing unprecedented floods, which have already been blamed for more than a dozen deaths and continue to threaten thousands of homes. Recent storms and unseasonably warm temperatures have caused a rare winter flooding of the Mississippi River, which rose past levees in parts of Missouri Tuesday, forcing hundreds of residents to evacuate and highways to shut down. As the National Guard continues to mitigate the situation, you can also do your part to help the Missouri flood victims. Several days of heavy rainfall has caused massive flooding from the Mississippi River, which Gov. Jay Nixon called "very historic and dangerous." According to AccuWeather meteorologists, the current flooding might reach levels that have not been seen during winter months since the 1800s. On Monday, Nixon declared a state of emergency, and on Tuesday, he enlisted the National Guard to help first responders and to help secure evacuated areas. 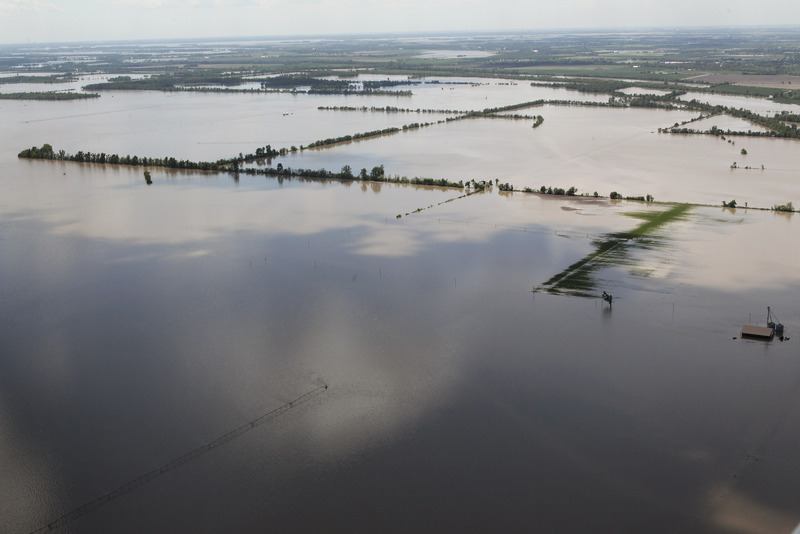 On Wednesday, aerial shots of the affected areas show houses almost entirely submerged. So far, the flooding has been said to have caused at least 18 deaths in Missouri and Illinois, with many more people losing their homes and possessions. And the devastation shows no signs of slowing down, as forecasters predict continued flooding in the upcoming days and weeks. In response to the disaster, the American Red Cross has set up multiple shelters in the St. Louis metro area to provide assistance to evacuated residents. The current shelters that are open are located at the First Baptist Church in Arnold, the Nameoki United Methodist Church in Granite City, the St. Robert Community Center in Pulaski County, the Tri-County Community Senior Center in Pacific, the Fairview Christian Church in Carthage, and the Bethalto Senior Center in Bethalto, Illinois. If you live in the area, you can donate food, clothing, and other goods for displaced residents or volunteer to help set up and run these shelters. There are several ways you can help the Red Cross in their emergency response efforts. The easiest way is to text "REDCROSS" to 90999 in order to make a $10 donation. Or, if you'd like to make a larger contribution, you can visit their donations page and select a higher amount. You can also choose to have your funds go toward their disaster relief efforts or toward your local Red Cross. However, if you'd like to make a contribution that's priceless, the Red Cross is always looking for volunteers. If you can make your way to the affected areas in Missouri and Illinois, you can assist the Red Cross in setting up shelters and providing food and comfort for displaced families. In addition to the Red Cross, other organizations you can donate to include The Salvation Army's Emergency Disaster Services, Samaritan's Purse, and World Vision. All of these organizations allow you to create your own fundraising page through their website dedicated to the emergency relief efforts you'd like to help. The United Way also has been helping throughout the flood with its 2-1-1 program. You can donate to the United Way and specify which Missouri or Illinois community you'd like your money to go to. Any contribution, no matter the amount or nature, could potentially go a long way during the Mississippi's life-threatening flood.